Investment bank First Metro Investment Corp. (FMIC) believes the Philippine economy will regain momentum this year on the back of the mid-term elections and infrastructure and consumption spending, among others. The Philippine financial system is unlikely to be shaken by the bankruptcy of a Subic-based shipbuilder, a Fitch unit said, although challenges should be expected overall given a possible economic slowdown. Environment Secretary Roy Cimatu said on Tuesday, January 15, that establishments in the Manila Bay Area without proper sewerage treatment plants (STPs) could be fined between P20,000 and P200,000. A magnitude 5.9 earthquake struck off Davao Oriental province Wednesday dawn, the Philippine Institute of Volcanology and Seismology (Phivolcs) said. THE Government Service Insurance System (GSIS) released a total of P190 million in cash benefit to its active members on December 22, 2018. A Russian group is eyeing the Philippine banana market as it looks to invest P8 billion for a plantation in the Mindanao region, Agriculture Secretary Emmanuel Piñol said. A HOUSE investigation on Tuesday found that Aremar Construction Corp., the contractor allegedly favored by Budget Secretary Benjamin Diokno, had received P81.1 million in kickbacks as part of bid-rigging schemes. THE ASIAN Development Bank (ADB) said the Philippines will benefit from a fast-disbursing parametric insurance pool, eyeing a credit facility for the program. The Bases Conversion Development Authority (BCDA) is bidding out the construction of airport to New Clark City access road – phase 2 and 3 – with approved combined budget of P5.397 billion. BIG investment banks scored a victory in their campaign to soften global rules, as regulators reduced the capital hit from new trading-book standards by nearly half. The National Food Authority (NFA) has already procured a total of 50,000 metric tons (MT) or 1 million bags of palay (unmilled rice) in the first two weeks of 2019. A Davao court on Tuesday rejected the motion to issue a hold departure order against Senator Antonio Trillanes IV. Mayor Majul Gandamra has been working on temporary housing in his battle-scarred city. The Department of Labor and Employment (DOLE) said it would assist some 3,800 workers of Korean shipbuilding firm Hanjin Heavy Industries and Construction Corporation to look for jobs, after the company went bankrupt. Birth certificates will no longer be among the requirements for renewing passports, the Department of Foreign Affairs (DFA) said yesterday as it downplayed the impact of the passport data controversy on national security. The Philippine unit of global shipbuilding giant, Hanjin, is now officially under corporate rehabilitation. Buhay party-list Rep. Lito Atienza said several lawmakers wanted to legalize medical marijuana because they themselves were eager to go into the business of cultivating the plant and running dispensaries. The Department of Foreign Affairs (DFA) finally issued an official statement on the possible personal data leak of passport holders. The Bureau of the Treasury (BTr) raised an additional P8 billion from its tap facility window for one-year IOUs last Monday, with strong investor demand reflected in the offer. Laguna-based P.A. Alvarez Properties and Development Corporation (P.A. Properties) is investing roughly P25 billion for the development of 25 affordable housing projects over a five-year period in various parts in Luzon. LISTED Bank of the Philippine Islands (BPI) has partnered with a Chinese technology company to bolster its digital platform as part of efforts to increase financial inclusion in the country and embrace self-service banking. Despite strong opposition being put up by business owners and employers, workers group Trade Union Congress of the Philippines (TUCP) is mulling the filing of wage increase petitions in all regional wage boards to raise the salary of workers amid the increases in the prices of food and services caused by the implementation of new excise tax on fuel under the Tax Reform for Acceleration and Inclusion (TRAIN) law this year. Private banks have expressed interest in financing the country’s shift toward the utilization of modern public utility vehicles (PUV), according to the Department of Transportation (DOTr). Daraga town in Albay and Cotabato City have been placed under the control of the Commission on Elections (Comelec) in connection with the May polls. Senator Antonio Trillanes IV pleaded “not guilty” to four counts of libel filed against him by former vice mayor Paolo Duterte and lawyer Manases Carpio. After last year’s inflation shock, a 5-percent slump in the currency and a widening current-account deficit, pressure is starting to ease. IBM launched in the Philippines Tuesday its technology education program that aims to make senior high school and college students more easily employable for “new collar jobs” after graduation. Advocacy group Laban Konsyumer, Inc. (LKI) has formally lodged its complaint with the Department of Finance (DOF) on the “overcharging raps” allegedly committed by the oil companies relative to the pass-on of value-added taxes (VAT) as component of excise taxes in the overall pump prices. What are the top issues facing the Philippine workforce this 2019? Newly elected Management Association of the Philippines President Riza Mantaring shares her views. Demand for office space in the Philippines from two big job creators – business process outsourcing and Chinese online gaming – could take a hit if a proposed tax change goes into effect and the US-China trade war isn’t resolved. Philippine National Police (PNP) chief Director General Oscar Albayalde on Monday led the turnover of almost 18,300 newly-procured police equipment worth PHP694 million to further boost the police’s operational capability and visibility. The Department of Trade and Industry (DTI) is eyeing another P1.5 billion for the Pondo sa Pagbabago at Pag-asenso (P3) to cover more micro businesses. 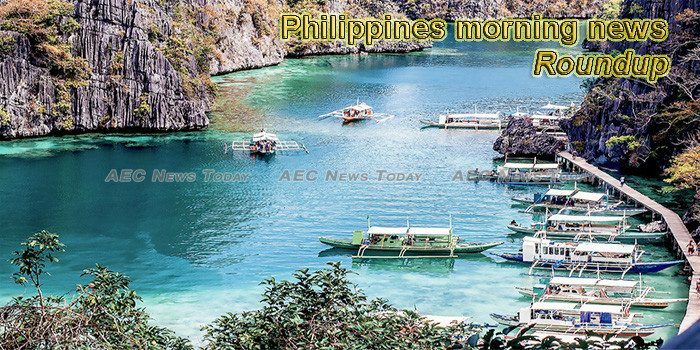 The Department of Foreign Affairs (DFA) will shoulder the expenses for the repatriation of the remains of the newlywed couple who drowned while on their honeymoon in Maldives.